A Candlewood Lake Wedding takes place in one of Connecticut's best kept secrets. Scenic Candlewood Lake is 17 miles long and two miles wide, and borders the towns of Danbury, New Fairfield, Sherman, Brookfield, and New Milford. The spot is popular because of its proximity to New York City, New Jersey, and lower Westchester County. The lake is the largest in Connecticut, and was created in the 1920s by the Army Corp. of Engineers and the Connecticut Light and Power Company, to be used to generate hydroelectric energy. The space was once acres of farmland, that is now covered by the beauty of the man-made lake. This photo was taken on the shores of the lake after a summer Candlewood Lake Wedding ceremony. The picture shows a tender moment between the bride, groom, and their baby girl. The little family stands by the edge of the lake, taking in the tranquility offered by the scenery. 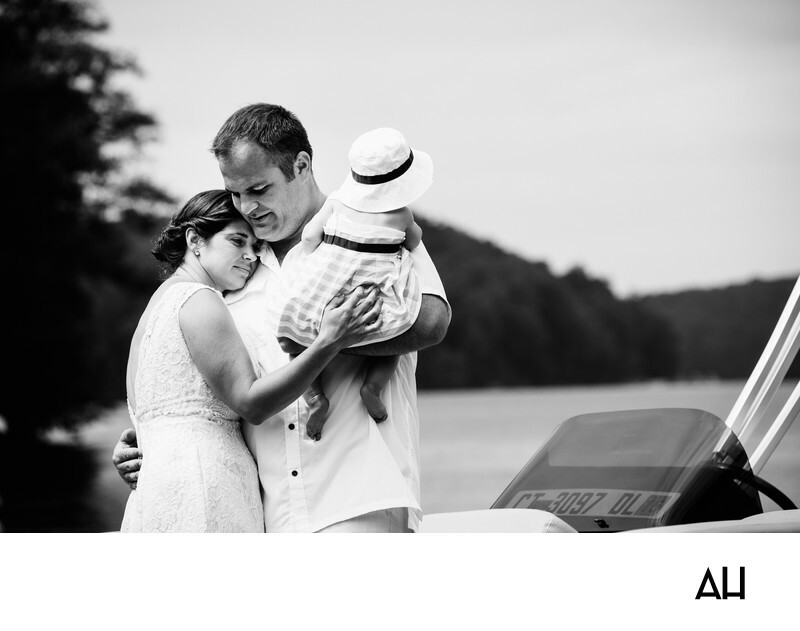 The groom holds his wife and daughter in his arms, his whole world captured in one timeless black and white photograph The black and white coloring of the picture gives a taste of the lake’s allure, without taking away from the image of the family standing on its shore. The groom is wearing a white, short sleeved button down shirt and khaki dress pants. He looks down at his wife who is beautiful in her lace wedding gown and she rests her head against his chest, as their baby looks out at the lake and the view beyond. The little girl does not even glance at her mother and father and, although it can not be seen in the picture, her expression of wonder is one that can only be seen in the eyes of a child.